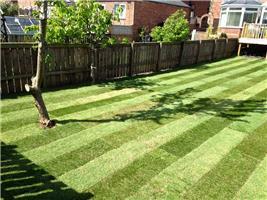 Oakdale Landscape & Garden Services - Fencing/Gates, Landscaper based in Darlington, Durham. Invoice history based on 74 reviews. Welcome to our Checktrade Page. Thank you for taking the time to look into our details and consider us to complete your work, you will not be disappointed. Oakdale Landscapes are an established company with over 20 years experience. I pride myself on the fact that my business has been built on word of mouth & referrals from previous customers. The diverse nature of our services demonstrates our commitment to our work. We complete the Jobs to extremely high standard. Oakdale can create high quality, practical, attractive and low maintenance gardens. We undertake any aspect of garden work, no job is to big or small. Just give us a call! !